The objects of daily physical abuse and appalling deprivation for up to 22 years, rescued Chinese farm bears (Ursus thibetanus) pose a comprehensive challenge to the Chengdu Asiatic Black Bear Rescue Center, created and managed by the Animals Asia Foundation. This study looks at the unique conditions of the rescued bears, examines the center’s rehabilitation program, and identifies the program’s limitations. Despite the world-class care provided by the center and the qualitative improvement in their health, the bears have irreparable physical and mental incapacitation that undercuts their chances to survive in the wild. This situation questions the moral ground of China’s bear farming and challenges its prevailing practices in captive-animal management and wildlife conservation. Importantly, the study highlights the need to accelerate anticruelty legislation on the Chinese mainland. Li, P. J. (2004). 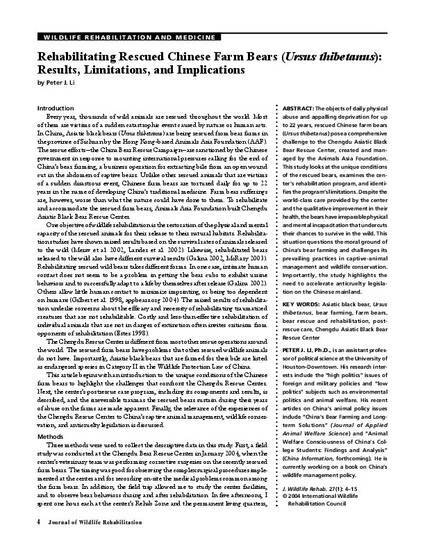 Rehabilitating Rescued Chinese Farm Bears (Ursus thibetanus): Results, Limitations, and Implications. Journal of Wildlife Rehabilitation, 27(1), 4-15.